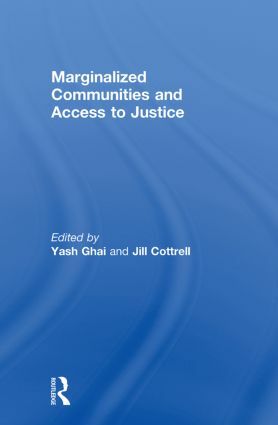 Marginalized Communities and Access to Justice is a comparative study, by leading researchers in the field of law and justice, of the imperatives and constraints of access to justice among a number of marginalized communities. A central feature of the rule of law is the equality of all before the law. As part of this equality, all persons have the right to the protection of their rights by the state, particularly the judiciary. Therefore equal access to the courts and other organs of the state concerned with the enforcement of the law is central. These studies – undertaken by internationally renowned scholars and practitioners – examine the role of courts and similar bodies in administering the laws that pertain to the entitlements of marginalized communities, and address individuals' and organisations' access to institutions of justice: primarily, but not exclusively, courts. They raise broad questions about the commitment of the state to law and human rights as the principal framework for policy and executive authority, as well as the impetus to law reform through litigation. Offering insights into the difficulties of enforcing, and indeed of the will to enforce, the law, this book thus engages fundamental questions about value of engagement with the formal legal system for marginalized communities.